What are You Playing this Weekend? I’m Going Crop Crazy! I’m having a really, really good play-through of Stardew Valley right now. I’ve only ever seriously played through once, but that was immediately after it originally launched on PC. Right now this play-through is on the Switch, and I’m playing 100% exclusively with my wife. Together we sit on the couch with the Switch docked so it’s on our tv, and she holds an iPad and looks up all the great little details on the wiki that she and/or I want to know (we determine how much we want to spoil) while I control our joint character. We’re halfway through Winter in our first year, and I think we’re making really good progress! We’ve actually managed to finish the entire craft room in the Community Center, and made headway into nearly completing several others. Right now the biggest thing holding us back is actually getting to the desert. My first personal play-through I never felt this progressed or wealthy. We only had maybe 4-5 3×3 crop plots, but we certainly maximized our profit potential. Right now in the winter we have chests full of crops that are feeding our 6 kegs and 6 preserves jars. We have a coop full of chickens, a barn with cows, our house upgraded with a kitchen, and a few other farm goodies. Oh, and our character got married to Abigail who, once you get to know her, turned out to be pretty awesome. She feeds the animals, waters crops, makes breakfast, plays video games, waters the dog. Perfect in every way! I’m really excited to see more of the new stuff that was added and progress further into the mines to unlock the desert and beyond. My wife is super, super into the game and wants to play for years. So we’ll definitely start working on the aesthetics of our farm layout to share some screenshots. What about you? Play anything good this weekend? Oh man, I am playing stardew valley’s multiplayer on PC for the first time with a friend who already played once. Being able to split chores has been AMAZING. We just got to fall, we are somewhat more progressed than you with the community center but a bit further behind in some of the amenities it sounds like. We JUST got cows online and want to upgrade barn and coop soon. She decided to mostly take control of the farming and foraging, whereas I went for mining and fishing which she has less fun with. I got to the bottom of the mine in the middle of summer and have mostly been fishing since then, as well as catching up with my social sphere to her (She had more time to go around giving gifts previously, though my top targets are about the same as her). I just caught my first legendary fish today! 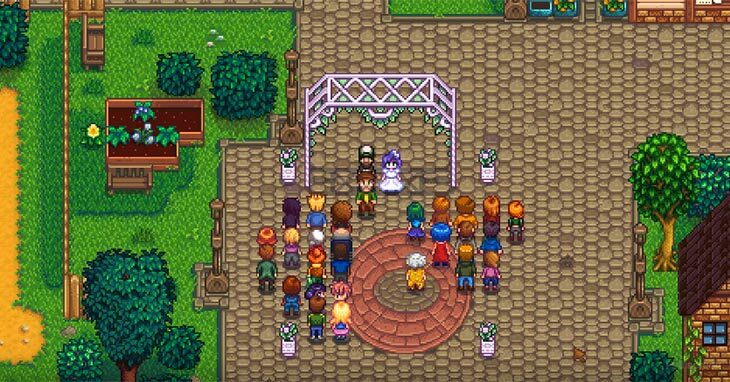 I decided to marry Maru and have her to 10 hearts but am holding off getting engaged so I can still give gifts to other women without her getting jealous, and she is still unsure who she is going to go for so is just getting everyone up. It’s been super fun, with the only downside being I can see not lasting all the way through the second year with the speed we are getting things done. Who knew a multiplayer harvest moon would be so amazing? Splitting things up would seriously (and literally) double my efficiency. There are literal moments I have to decide if I have time to fish or time to tend my farm. Yup, I have no idea how you would ever find time to go mining single player, at least not at the rate I did. I’ve easily supplied all the ore needed for both of us as well as tons of gems to throw around as gifts. But it takes so much energy you have to plan your excursions to take functionally the whole day…if I also had to tend crops and do other miscellaneous stuff too? I made a ton of mining time up in Winter. Managed to actually get to level 120 in the mines. Now I’m set up with 12 sprinklers ready to tackle some serious farming in Spring to fund the fixing of the bus.